Michigan pipeline spill / Kalamazoo River. The EPA estimates this spill exceeded 1 million gallons, and has now traveled more than 35 miles downriver from the point of origin since the leak began on July 26. Michigan governor Granholm is urging more aggressive response to keep this spill from reaching Lake Michigan. Louisiana blowout and spill / Barataria Bay – Bayou St. Denis. 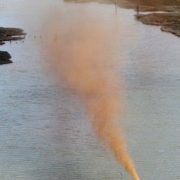 The Coast Guard is saying it will take at least 10-12 more days to plug the abandoned well that has been spouting a 100′ geyser of oil and gas out of water since it was hit by a barge on July 27. Dalian, China pipeline explosion and spill. Greenpeace claims this spill is much larger than reported by the Chinese government – possibly 60 times bigger, based on revelations that Chinese workers purposefully dumped oil into the ocean so it wouldn’t feed the raging inferno and cause more destruction of storage facilities onshore. Greenpeace also claims a full oil storage tank capable of holding about 28 million gallons was destroyed during the fire, possibly releasing its contents into the water as well. BP / Deepwater Horizon spill, Gulf of Mexico. The containment cap is holding, remains shut, and no new oil has leaked into the Gulf from the Macondo well since July 15. 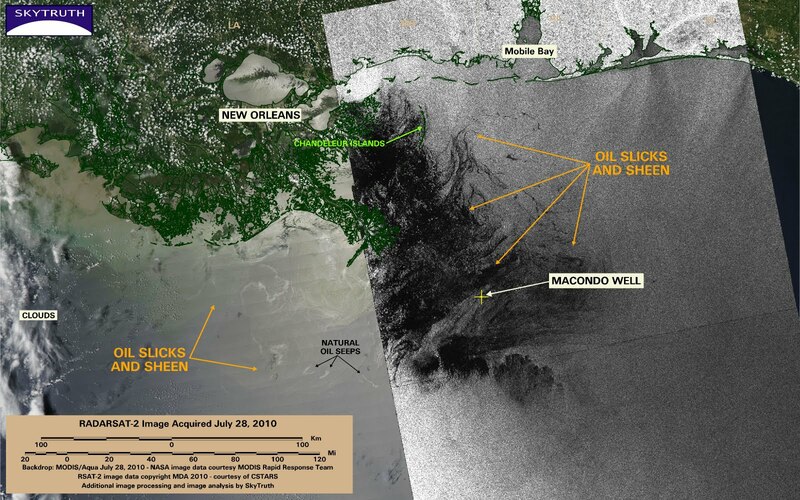 Although thick, “skimmable” oil slicks have reportedly become hard to find floating on the Gulf’s surface, questions remain about how much oil continues to linger beneath the surface and out of sight. Recent satellite images show what we assume is mostly thin sheen still present across a large area. The much-anticipated “static kill” procedure to pump drilling mud directly into the well through the cap is now planned for Tuesday, with the relief well in position to begin intercepting the Macondo well by August 11 or 12. Successful execution of the “bottom kill” procedure – pumping more mud, then cement, into the well via the relief well – could take an additional three weeks. Today’s MODIS / Aqua satellite image of the Gulf seems to have good illumination conditions for showing oil slicks and sheen east of the Delta. We don’t see much indication of the widespread sheen that was present on the July 28 imagery, although a large part of that oily-looking area is south and slightly west of the Delta and obscured by clouds on today’s image. Stay tuned, this continues to be a very dynamic event. Yesterday’s MODIS and RADARSAT images show something we didn’t expect: slicks and sheen spanning nearly 12,000 square miles. Based on other reports, and the recent trend on satellite images indicating steady dissipation of the surface oil slick, we are optimistically assuming that nearly all of this is very thin sheen. 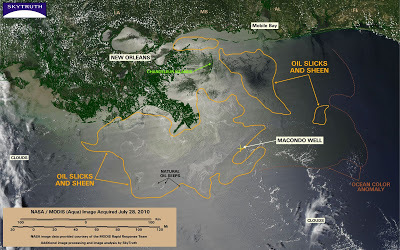 The MODIS / Aqua satellite image above, taken at 2 pm Central time on July 28, shows oil slicks and sheen (encircled with orange line) that we think are likely attributable to the BP / Deepwater Horizon oil spill, spread out across 11,832 square miles (30,644 km2) in the Gulf of Mexico. We’ve marked the eastern edge of a persistent ocean-color anomaly with a dashed line; this anomaly may simply be related to the Mississippi River discharge, or could indicate an area where ocean chemistry has been affected by oil, dispersant, and/or dissolved methane from the spill and cleanup response. Three small slicks attributable to natural oil and gas seeps are also marked. RADARSAT-2 satellite image (black-and-white) taken July 28, 2010. RSAT-2 data courtesy CSTARS. We overlayed the RADARSAT-2 image (black-and-white) taken at 6:48 pm Central time on the MODIS/Aqua image taken earlier that same day. The large dark area on the radar image is probably oil slick and sheen from the BP oil spill: wind conditions throughout the area were ideal for slick and sheen detection on radar satellite imagery, ranging from 2 to 8 meters per second with minimal gusts. Weather satellite images taken at about the same time showed few clouds in the area and very low chance of any rain in the vicinity. 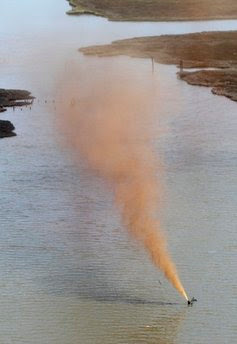 Fountain of natural gas and crude oil from well blowout along Louisiana coast this week. Source: Associated Press. An estimated 800,000 gallons of crude oil gushed from a failed pipeline operated by a Canadian company, inundating a creek and flowing into the Kalamazoo River in Michigan. The leak began on Monday, and was stopped on Tuesday. Containment and cleanup operations are underway, but so far a 16-mile stretch of the Kalamazoo has been fouled by oil. The cause of the pipline failure has not yet been reported. 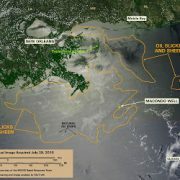 On Tuesday, a tug boat collided with an “orphaned” oil well off the Louisiana coast near Bayou St. Dennis, between Lafitte and Grand Isle, leading to a blowout of that well that is still shooting a fountain of light crude propelled by natural gas up out of the water and 100 feet into the air. The boat sheared off the wellhead and control valves on the well, located in water only about 6 feet deep. Hopefully it will be controlled and permanently plugged today. Obviously this well had not been properly plugged with cement to prevent such an occurance. An “orphan” is a well that the operator simply (and illegally) walks away from. In this case they walked away in 2008, and the state declared the well abandoned. This well has been a ticking time bomb ever since. And by the way, there are 27,000 abandoned wells in the Gulf of Mexico, including 3,500 wells that have been “temporarily” abandoned – some for years – without being permanently plugged. Maybe it’s time to fix this. The deadly and still-dangerous Macondo well is not yet permanently plugged. Oil is still lingering out of sight, beneath the water’s surface, a few inches deep in some places and thousands of feet down in others. Nobody know how much oil remains in the water column, how long that oil will linger, where it will end up, and what the impacts will be on the Gulf ecosystem. 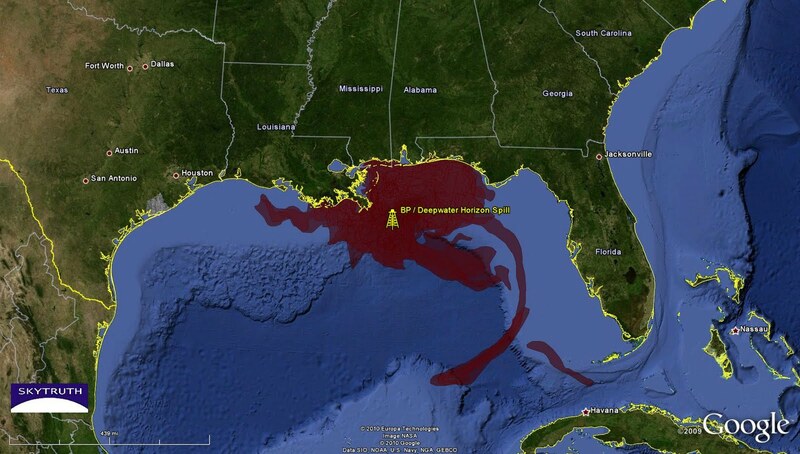 Our preliminary analysis shows oil cumulatively covered 68,000 square miles of Gulf waters. Oil reportedly came ashore on hundreds of miles of beaches and wetlands. Oil is deeply embedded in marshes, and buried under the sand on beaches. This oil could linger and have toxic impacts for years, possibly decades. Less oil on the surface does not mean that there isn’t oil beneath the surface, however, or that our beaches and marshes are not still at risk. We are extremely concerned about the short-term and long-term impacts to the gulf ecosystem. At SkyTruth, we’ll keep looking at the Gulf. If funding allows, we’ll use satellite imagery and other remote-sensing techniques to track the future health of marsh grasses and coastal ecosystems where oil made landfall. Fingers crossed: it looks like the cap on BP’s Macondo well will hold until the relief well intercepts and permanently plugs it, and no more oil from this blowout will enter the Gulf. 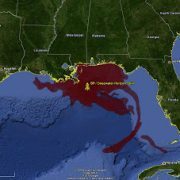 So here’s a map showing the cumulative oil slick footprint for the BP / Deepwater Horizon oil spill, created by overlaying all of the oil slicks and sheen mapped by SkyTruth on satellite images taken between April 25 and July 16, 2010, blogged here, and published in our gallery.